Pix'n Love Publishing's book The History of Nintendo was until now only available in French, but after a pre-order run last year it's now available to buy. The 240-page book spans Nintendo's humble beginnings in 1889 until the early 1980s, with more than 2,000 exclusive pictures illustrating the story along the way. The book costs £24.99 with free worldwide shipping direct from Pix 'n Love Publishing, or alternatively can soon be found on the shelves of Travelling Man, HMV, Foyles and Forbidden Planet stores across the UK. Presenting the Ultimate guide to the fascinating historical origins of Nintendo. This highly detailed deluxe publication delves into the rich and varied (and often forgotten) 120 year history of the world's leading video game company. For the very first time ever Nintendo's historical product portfolio is catalogued in painstaking and loving detail, with over 500 card games, tabletop games, toys, electronic and arcade games all compiled into one superbly crafted book. This deluxe collectors book details Nintendo's humble beginnings as a playing card manufacturer, charting progress through the entire range of toys and games, including such legendary products as Love Tester, Ten Billion, Ultra Hand, Custom Gunman and hundreds more, progressing up to the first video arcade games, home consoles and game & watch series. Every card game, every toy, every product, meticulously catalogued and pictured, and compiled into a rich myraid of content that will literally draw you right into the pages in awe. The book is a high quality collectible item, with 240 full colour glossy pages featuring over 2,000 exclusive pictures, and a plethora of engaging and unbelievably detailed documents, write ups and humerous anecdotes. This is a world's first — and the only book of it's kind. No Nintendo fan should be without this book. I wish I could buy it . I must buy this! I wonder how difficult/expensive it would be to import to the U.S. I'm lucky enough to have this volume already (it's actually been available in English for quite a while now). It's smaller than a standard size magazine (more like A5) and comes with a plastic sleeve to keep it protected. With 240+ pages, it's a brilliant read - choc-full of fascinating Nintendo facts and photos. I'm very much looking forward to Volume II. ...PS. I've just checked, and there's one on eBay right now for 0.99p!! What, this is news? I bought it like half a year ago... It even says on the site that it was released 2010/08/25. That being said, it's a great book. I really recommend it! This looks pretty good, I might get it at some point. Hi all , I run the UK / English language branch of Pix n Love Publishing, so wanted to post here to say I am available to answer any questions anyone might have regards this book, and our other books. This goes for customers in the US or anywhere else, not just the UK. Aha, I guess that explains it. Didn't realize that wasn't an official release. To explain a little better, Pix n Love were testing the waters last year in terms of the English language market, with a pre order run sold just through word of mouth and direct from their web site. I would sincerely hope so, but we are focusing on the UK now, since we are based in Europe. We do have free shipping currently for US customers ( actually for all customers regardless of location ) on our web site though, for anyone who wishes to buy it. @Pix_n_Love so when does the book hit shelves? Mmm my mom has been nagging me to read more. @PIx_n_Love how does it work out with the currency conversions if us US folks buy it? Oooh, definitely on my wish list! Hopefully I'll see it someday in Canada. Is this the same book I bought last year? The same English translation? Anyhow I loved the book, I can't wait for the Game & Watch volume! I got Nintendo's history in my hands! @Pix_n_Love FP, HMV and Travelling man didn't have it in nor is it listed on their site. Sad times. Just ordered it. And I'll get every other volume that comes out. I'll wait for Volume two, which should concern more with their video games more than their older stuff. There's a book like this already out that's called Super Mario: How Nintendo Conquered America. I'm still getting this though. I`ve already got an issue of super mario: and how hintendo conquered america. but i may invest in this too. Nintendo is my life (hence, the reason I come to NintendoLife ) and this is definitely something I want to read. I'd love to have more knowledge about my favorite video game company ever! I really want this! This must be mine! WANT! Give me, NAO! etc. Ordered. Gosh, this looks awesome! dude, I need this book! I got it last year with an english translation and i still have mystick it not that says thank you for your support daniel! a little conffused about the article though. is this the second volume? I have the French edition (I'm French, that helps) and it's really awesome. These "pre video games" years help us understand the roots of Nintendo and some of their choice. 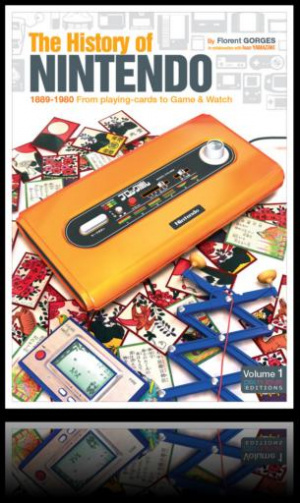 And the toys Gunpei Yokoi invented are really great ! The book is filled with previously unreleased color photos. NintendoLee - If you don't see the book physically on the shelves in say Travelling Man or FP, it will be somewhere along the process of being out out on them. I am sure if you ask in those specific stores they will be able to give you more information. If you want to e mail me at themachines@live.co.uk I can give you more specific guidance on the books on sale locations now and coming up. Ordered it on Amazon Marketplace. It's nice they are featuring some of Nintendo's pre-videogame past. @Pix-n-love: Is there going to be a volume two book covering Nintendo's Video Game Years? Also, does it provide coverage on Nintendo products from all regions (US, Europe, Japan) or does it primarily focus on the Nintendo of Europe division?